When it comes to serving our veterans, there are a variety of care options to be aware of. Some veterans are able to get the level of care they need through regular trips to the VA. Others, however, require a more intensive form of care, including long-term care at home or in a nursing facility. Fortunately, there are two ways that veterans can get the help they need thanks to the Aid and Attendance pension as well as Housebound Benefits. Join Patriot Angels as we dissect the differences between these two veteran services. What Does it Mean to be Housebound? The VA uses housebound status as a way to determine eligibility for some benefits. To be housebound or homebound, the individual is unable to leave their home without challenge. Generally, these challenges are related to age, illness, or disability. These challenges can be service related in some cases, but do not have to be to collect housebound benefits or pensions. How is Housebound Status Determined? The VA and Medicare use two different sets of factors when deciding whether an individual is housebound or not. 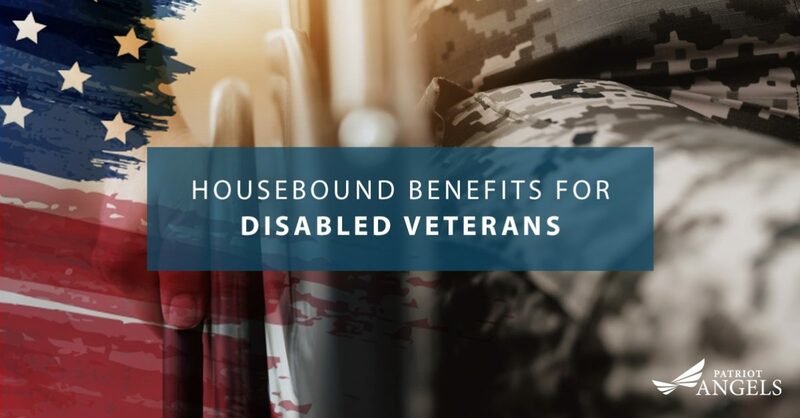 To be considered housebound according to the VA, an individual must have a permanent disability that has received a 100 percent disability rating. Additionally, the veteran must not be able or must struggle to leave their home. Alternatively, the veteran could have a secondary disability that is at least at 60 percent rating. These disabilities do not have to be service related. The determination of housebound status can be made after the veteran meets with a private medical practitioner or VA medical practitioner. Medicare uses two factors when considering housebound status. The individual must not be able to leave their home without assistance of some kind, be it another person or some sort of equipment like a wheelchair. Similarly, if the individual’s medical practitioner feels the patient’s condition will worsen if they were to leave their home, they are eligible for housebound benefits. Despite these factors, the individual is still allowed to leave their home for certain events without compromising their housebound status. That includes things like church, medical appointments, or family functions. Can You Collect Aid and Attendance and Housebound Benefits at the Same Time? No, you cannot collect both of these benefits at the same time. That’s because both of these programs are meant to be paid in addition to any monthly pensions that a veteran may already be collecting. Both programs offer funding that the veteran can use toward their care costs. Generally, the Aid and Attendance offers more money each month, and these funds can be used for home care costs as well as costs associated with care from a facility like a nursing home. However, applying for housebound benefits may be easier and faster to do in some cases. Interested in learning more about the VA Aid and Attendance pension? Browse our FAQ page and then contact our veteran services specialists to find out more. Patriot Angels has helped dozens of veterans and their families get the support they need. Contact us today to set up an appointment.